Until now Masahiro Sakurai, his team and Nintendo have revealed new challengers for Super Smash Bros. on Wii U and 3DS through a combination of Nintendo Direct broadcasts and sudden updates on the official website. There seems to be a big announcement coming, however, as they've gone so far as to provide advance warning, and a countdown, for the next unveiling. On 14th July at 7am Pacific / 10am Eastern / 3pm UK / 4pm CET and midnight AEST (15th July), Nintendo will broadcast a three minute New Fighter Intro Video. That's quite a lot of hype for a character reveal, so we naturally expect it to be something special. We'll be watching when that rolls around to kick off next week. You can even watch a countdown below, if the wait is just too much. Thanks to Donavan for the heads up. A bombshell from Nintendo. Excellent! Wow so random. The hype is real, lads! Please be captain falcon. Also, add F Zero. If it's a newcomer to the franchise, I think it'll be Chrom. Otherwise maybe Captain Falcon with a new F-Zero announcement attached? Shulk? How many characters already? I'll bet the last one would be "Bayonetta climaxes in!" Come on, you guys! We all know about the SSB Effect! Whatever appears in SSB eventually comes out of it. Come on, it even managed to reboot Kid Icarus! @erv Captain Falcon is a newcomer? Okay. Maybe a veteran, because a lot of newcomers was announced last month. I can't believe Captain Falcon isn't in this game yet but Bayonetta would not surprise me either. So those two would be safe bets. I would however prefer it to be some Nintendo character that we have not seen in a while like Mike Jones or maybe the dog from Duck Hunt. Why do people want Geno he's not relevant nor was he even a worthwhile party member in SUPER Mario RPG. High hopes for another 3rd Party character lowest or expected hope another Nintendo main character. @TheWPCTraveler ...Except for the Ice Climbers. They've been in two games now and haven't done anything to earn their keep. w00t!!! I'm hoping by "new" they mean a new and not returning, although either is perfectly fine. I'm hoping for Chrom or Shulk honestly. I'd love to see King K Rool as well. As far as returning... anyone. Guys, it's going to be Nabbit. And they'll rename it Super Nabbit Bros. Non Specific Action Figure. No doubt. Too many fighters to call it. Hopefully it's someone old like Ness or Cap'n Falcon. I'll go w/ someone from HW, probably Midna, not the random anime chick. Ild like Bayonetta but feel like they already put her in as Zero Suit Samus. And since nobody mentioned him yet Illbeat @sinalefa to the punch and say Wonder red. I'm hoping for King K. Rool or Dixie Kong, but just for fun, I'll take a stupid guess and say that it will be Reggie Fils-A-Mech. Why else would Nintendo have made that character?! Is it too early to hope for Shovel Knight? I'm obsessed with that game. That's interesting. Whatever it is, they want it to be hyped up to the max. So is it too much too hope that no single character deserves his own ND and this is just a ruse for the release date at the end?!! Maybe Sakurai finally caved and let Miyamoto put Popeye in. For a character to get a big reveal like this it seems like it would be from another third party franchise. As much as I love him, it would be a letdown for this to wind up being Groose or a similar obscure Nintendo character. I'd like another F-Zero character besides Captain Falcon too, but.. would they even reveal one of those while the Captain himself hasn't even been seen yet? Aaaah it's too much! Perfectly timed for my brother's birthday. How appropriate. I'll go way out on a limb and call Ridley! I'm expecting a returning character though (captain falcon or since this is close to Earthbound anniversary, an Earthbound character). Man, do you really have to butcher my name like that? Edit: thanks for fixing it! I would die of happiness if it was Mr. Wedgewood or Cereza. But I am not very good at guessing or getting hyped so I won't propose any names. But if it is not a newcomer they are definitely shooting themselves in the foot. I'm thinking Bayonetta, or TINTIN YEAAAHHHHHHHHHHHHHHHH no really I'm thinking Bayonetta. @sinalefa It's going to be a newcomer, as they get trailers while veterans don't (except for Sonic's 30 second gameplay clip). The title of this article even explicitly says "New Fighter". If anyone is expecting a veteran character like Captain Falcon or Ness to be shown, they'll still be in the game one way or another. They just won't be announced on Monday's trailer. Then I don't get people asking for Captain Falcon. And I would rather have Cranky Kong before K.Rool. Welcome K. Rool supporter . Seriously though, I see this being one of the Shulk, Chorus Men, Chrom, Ridley OR Sceptile/Mewtwo. These are the only guys that have enough evidence for them that I won't be surprised to see them. Holding out from expecting anyone else, out of inevitable disappointment. Viewtiful Joe is who I'm hoping for. Or maybe Wonder Red. I wonder if they'll do something similar to the Smash Bros. Direct and make the video about a returning character...and then spring a surprise newcomer on us at the last second. That would be fun. I think we will see a newcomer. I want Ness, Lucas, or anyone from the Mother series, really. But I'd take a newcomer completely out of the blue, too. I want either King K Rool or Young Porky Minch. "Retro"-wise maybe Takamaru or Bubbles (they semi-started the trend with Ice Climbers then Pit..alluding to his retool). if Rhythm Heaven is getting a newcomer, i'd rather prefer Karate Joe than Chorus Kids/Marshal just because he'll actually fight than just summoning minigames for attacks. I think @wayward is right, it's gonna be another third party character judging by the attenton they're giving it. No sign of Snake yet. I think they're gonna replace him with Simon Belmont from Castlevania. @sinalefa I don't understand why people are asking for Captain Falcon either. Regardless, they'll be disappointed that he won't be revealed on Monday, but he's definitely going to be announced later anyway. Also, Cranky Kong is already on the Jungle Japes stage in Smash 3DS, unfortunately. He's not going to be playable. @Sensei_Sendai I'm glad that I'm not the only one here that watched that show. Only new fighters to the game have gotten videos and since this is being counted down on a YouTube video this must be a big character. Other characters will probably be revealed in the screen of the day like captain falcon but this has to be a big character to get a three day heads up. The last time we got this we got five characters one of which was new. So I am only thinking this one will be awesome. I'm really hoping it's Shulk. 1. This means no July ND. 2. Does it necessarily mean one fighter? 3. It's likely to be a new challenger. 4. It's unlikely to be character(s) that haven't had a year recent Nintendo game, or one coming, as it needs to promote current Nintendo interests, so I doubt it's Simon Belmont. 5. With this amount of to do, I am guessing Bayonetta, Skull Kid, Shovel Knight or a fake out and announcing return of Wario. Does anyone realize how perfect Rayman would be in SSB 4? Wow, he would be another good addition. Solid Snake? Captain Falcon? Mr. Game & Watch? Jigglypuff? Big Boss (I know, the changes for him to join are too low)? Jin/Devil Jin? Bayonetta? That red person from Wonderfull 101? Ryu? any first party character? Edit: What about the Elite Beat Agents? A 3 minute video? That's pretty big, RIDLEY CONFIRMED! Its obviously Hector from FE7. Guys is it possible that they might reveal Zero from Megaman X, or maybr Tails? Shadow the hedgehog please. I don't care what the haters say I just want to CHAOS BLAST into Mario's face and seeing him yell MAMAMIAAAAAA!!!!! That would be hilarious lol! Oh please let it be Ghirahim. @FilmerNgameR Shadow's already confirmed as an assist trophy so no chance. @FiveDigitLP no. Rayman would not happen, nor is it a good idea. He doesn't exactly have the same pedigree as the rest of the characters. no one knew who, or what Rayman was until Origins. if legends had remained WiiU exclusive then maybe you would have an argument. just look at the leaked list to think of who it could be. I would put my money on Shulk. Yeah I made the connection between F-Zero X and july 14. but since it is a video. I doubt it unless he gets announced alongside the new character. I would honestly love Non Specific Action Figure more than anyone else. I'm pretty sure its Bayonetta. Why isn't Kunio in the running? Isn't he the best fit? I'd be happy with Bayonetta, though. As awesome as Bayonetta would be, she's far too risqué to appear in an aleady established Nintendo franchise. Nintendo have made it clear they've no problem have mature rated games on their systems these days. But Nintendo's franchises themselves remain family friendly. @argol228 Cause no one knows who Rayman is and yet everyone knows who Shulk is...? I think not. I'd love to see Shulk, but he's from one obscure game that not that many people bought, while Rayman has been in multiple games from multiple generations of consoles. I'm just trying to think of what would be a logical character based on them having a countdown for it. Just about all of the "big" first party characters are already taken, so it almost has to be a 3rd party one. If this is Pink Gold Peach I'm going to be very unhappy. Third parties: Mickey Mouse, Optimus Prime. @FiveDigitLP I never said that. I said Rayman didn;t really become popular until origins after what, 10 years of not even having a game. Xenoblade is a nintendo exclusive game, there is a new Xenoblade coming out. Rayman has been on multiple platforms and ubisoft screwed nintendo out of legends being exclusive. put Rayman up against Megaman, Sonic and Pacman. he is a speck to them in fame that is why they are in smash bros despite not being first party. Snake in Brawl was because kojima and sakurai are good friends and Kojima basically begged. I doubt Sakurai would be that friendly with a french game dev. Fortunately it has to be Isaac, there's no Golden Sun reference in the game yet whether playable character, assist trophy, regular trophy or just a gallery sticker. Also the current Golden Sun game ends on a cliffhanger (again!) so it would be nice if Isaac is here just to advertise an upcoming Golden Sun game for 3DS or Wii U.
I feel this being more important than just a new character. Maybe it's a new third party or a very unique fighter like the mii fighters. My Dad and I engaged in a bit of speculation regarding this 3 minute video. A 3 minute video isn't abnormal, but announcing it in advance is different than what they have done so far. They want people paying attention to this. I don't expect it will be a veteran character, which leaves a new Nintendo character or a third party character. After the attention that Pac-Man got, if it is a third party character then they most certainly want the media paying attention. I can't think of many 1st party characters they could add that would demand this level of attention. I can think of 1st party characters, but not many people know about them. Paper Mario, Chrom, Shulk, Robin, Groose, Tingle, Ridley, Bowser Jr. Nothing that couldn't just be announced though. What about third party characters? There are already fighters from Capcom, Sega and Namco. We thought of a few. They aren't exactly likely though . My dad waa thinking along the lines of what would grab attention. After Miyamoto's playful statements suggesting that they could already be talking with Mojang, he thought it would be a good idea to announce Minecraft for Wii U and Steve for Smash Bros. Unlikely, yes. But it would get a lot of attention. Level Five has given a lot to the DS. Professor Layton would be a possibility. His series is over though. I can see both sides. Ubisoft has made a decent amount of games for Nintendo. I could see Nintendo making a deal with them that they would get a character in Smash Bros. if they continue to support Nintendo systems. Rayman is the logical choice. He has had games on Nintendo systems since way before Origins, even if you don't count the Rabbids. He could have a decent moveset and he seems likely to have games on Nintendo systems in the future. But the best thing would be if they announced CDi Link. It's Bomberman. Probably not, but for now, to me, it is. Or Doshin. I hope it's an iconic character, that's never been in past Smash games, and has been in games from the 80's or 90's at least; Simon Belmont, for example. Most likely someone from the gematsu leak. Personally i hope its the choir boys. Also fawful/midbus is welcome. I don't think it will be anyone like Chrom or Shulk. I do believe those two are going to be in the game, but they both come from niche RPG franchises. I can't believe they would warrant an entire Trailer that comes with a countdown. I wonder if it's a fourth third-party rep? Yeah. King K. Rool and Ridley are fairly major Nintendo names, but do they deserve their own countdown when characters like Little Mac did not get one? Now the question is, which third-party character is it? Soooo, only a few people here want Snake back? Aww, I admit he was out of place, but so was everything else. Ah well, as long as we get either Chrom or Ridley I'll be fine. Bayonetta is too M-Rated to appear. This is weird, they've never done anything this big for just a new playable character. I don't want it to be another 3rd Party character though, I think they have those covered pretty well right now and are all Smash needs. @Imagamerboi Rayman would be a pretty cool addition, but he'd probably get delayed. I'm super excited! I really want it to be a Golden Sun rep! Imma laugh and be excited if the new fighter is Hatsune Miku. Rayman joins the fight! You unlock him by waiting for six months. @Luigifan141 And here I'd thought I'd dreamed that movie.... Oh dear. But really, I'd like to see The King too. @Luigifan141 I was waiting for someone to pull that out. I would love to see him in. Since the trailers aren't normally 3 minutes long, I would say there's going to be at least 2 in there. It is a New Fighter video, not a New Fighter's video, after all. I want K. Rool and the Chorus Men. Even though I've never played Rhythm Heaven, I think they would be one of the more interesting fighters. Another guest maybe? Maybe Snake will return? Almost seems people wont be happy with one person. I'm going with Capt Falcon, or Bayonetta. Sure would love a new F-Zero. I am putting out my obligatory wish of Jill, from Drill Dozer I am always the only one to suggest her and I want to keep it that way! Come on Sakurai, I know you have it in you. @Hero-of-WiiU I would be fine with one, as long as it's somebody cool. Like K. Rool. Maybe... The Chorus Men would need a three minute video to explain how they work? Same with Wonder-Red... BECAUSE I WANT HIM! @argol228 Explain how Pit came to be in Brawl, then. And I have no clue who Shulk even is. Rayman would be an awesome addition and would fit perfectly in the Smash Bros universe, but unfortunately he belongs to Ubisoft. Since they're hyping this up so much, my guess is either Ridley or the Chorus Men. Leaning more on Ridley though. Rayman is going to be DLC, that will be developed but delayed until there is a greater Wii U market. 3 minutes? I can see it being something like the greninja trailer where a veteran is announced alongside a new commer. Or my crazy imaginary dream scenario where there's an epic trailer where at first we see 3 swords pointed upwards in a 3musketeers style pose and then they start fighting and it's revealed to be Chrom, Shulk and Takamaru. Each with their own unique sword style. This is based on the Gematsu Leak and a leak that occurred a long time ago, early in SSB development where a person claiming to have met or been involved with people working on smash stated that Sakurai was planning on introducing Little Mac and Takamaru, one as the western rep and the other as the eastern rep. But it's unreliable. We shall see. I like me some swordsman. Anyways, do people see the NEW in the title? No returners in this trailer according to the title. So no Falcon or Snake. I know I'm the only one on the planet, but, GOD!! !, I am so sick hearing, seeing and reading things about SSB4! @FalconPunch Yes, Wonder Red would be great! @sinalefa - "Man, do you really have to butcher my name like that?" Sorry, it's how I pronounce it in my head - "sin-full-uh". Though based on the actual correct spelling I'm guessing you pronounce it differently. I pronounce "rjejr" "ree-jur" if you care. I started using it years back when you code enter your name in JRPGS and "ree-jur" actually sounds a lot like some of the names in those games. Though it is weird calling him rjejr in WW HD after 30 years of calling him Link. My kids and I actually still call him Link, but everybody in the game calls him rjejr. Oh, and its just my initials, nothing exciting about it. @TeeJay I can't believe you asked that...I mean really. Pit is an iconic nintendo character that Sakurai clearly has some love for. considering he is responsible for Uprising. @NavySpheal I sort want to see a certain masked swordwoman in smash, myself. Wart, Mike Jones, Simon Belmont, Bill Rizer or Arthur from Ghosts 'n Goblins. @WillMelnyk New fighter can be considered as either new fighter to the franchise or new fighter to the Wii U and 3DS versions. The latter of course could mean returning characters such as Captain Falcon. Pleaseeee be Shulk! Come onnnnnnn Shulk!!!! That day is directly after the end of EVO. Maybe captain falcon as he is always a hit with the competitive community. Nobody hates capt falcon mains. The guy is too stylish. Meh, more characters. I prefer deeper balance and less characters to more characters and stupidly strong chars like metaknight. Screw Shulk! It's Reyn Time! I really want to see Shulk announced. And/or Bayonetta. George Washington from the Nintendo exclusive Mad Men Football. @argol228 Uprising came AFTER Brawl. I'd say the only reason Uprising came to be was because of his appearance in Brawl. He popped into Brawl out of no where after being dead for over a decade as well, without even having a recent game beforehand like Rayman has. Not defending Rayman, though. I like him and I grew up with him and I think he'd fit the Smash mold perfectly but again, he's Ubisoft property. Guys it says NEW FIGHTER. Captain Falcon is a VETERAN FIGHTER. WE ARE GETTING THARJA!!! HYPEEEEE!!!! @TeeJay what I mean is, Sakurai put him in Brawl for a reason. proof of concept. Sakurai had uprising in mind long before it was announced. I'm calling Shulk, Bayonetta, or Chrom. Maybe Issac. @RantingThespian ... Replacing Snake with Bomberman? I want this now. @Imagamerboi He was gonna be in but they couldn't figure out how do handle those limbs heh. @ModestFan93 Who said he had to have limbs to fight? It should be either the pig form version of Gannon, or the Question Mark Block from the Mario games. Here come's the Chorus Men/Shulk reveal. When Cranky joins the battle, Alfonzo walks around the Jungle Japes level! I think there may only be me who genuinely doesn't care about this game and will def not be buying it. Maybe it's Nathan Drake. After all, his game sucked so maybe he jumped ship. It cannot be Captain Toad since he can't jump. As for yours, I pronounce it R-J-E-Jr. I supposed it was your initials and your title, as in Junior. To be honest, even though I'm sure people will be angry if it's a "returning" character, I wouldn't mind it being another returning character. I was one of the few actually happy they brought Toon Link & Yoshi back. I'm also on the Isaac train. @sinalefa I'd also rather have Cranky than K Rool. I think Cranky would be a really awesome character. Probably unlikely though! My money is on Shulk. i wonder who itt could be? waluigi? some other pokemon character? @xj0462 Did you not see the screenshot of him as a trophy with Sakurai specifically stating "Not everyone can make it in"? Honestly. As for everyone crying for Captain Falcon, can you all not read?! Sorry just needed to get that out of my system. Calling it right now... It's Shulk. If it isn't Shulk, then it will be Chrom or Marshal. I'll be happy with any of them, but I'd prefer Chrom since he's the only character I really want in. Seriously, if they add him, than the roster will be perfect for me because it'll basically have every character I want. Except Wario, Ness, Jigglypuff and Mr. Game & Watch, who haven't been confirmed yet. Sadness? Shulk? Sadness? Bro, do you want to take this outside? We have a problem. I would like to see Zero from the Mega Man X Series, or Knuckles from the Sonic the Hedgehog series. …The Entire Cast of Skylanders Trap Force or whatever, but you have to collect their figures to unlock each one! …Master Chief- 's finishing this Fi- no wait, he's just really really lost. …Adam Jensen- Didn't ask for this. …Captain Shepard- has to go now, to Smash Bros.! …Optimus Prime- is transforming and rolling out! Personally, I'd like the return of Snake. Mewtwo and Captain Falcon would be welcome too. Is G&W confirmed yet? But to go to this level of hype, a newcomer seems likely. But no one comes to mind right now… maybe they'll pull a Kid Icarus on us again, and bring back an age old franchise with a new entry to that franchise following soon (ish) afterwards? my vote: All New character announcement: a new main character for the FZERO series along with an FZERO reboot! It would blow people's mind if it was snake calling it now. I have no idea why anyone thinks Bayonetta has even the slightest chance of getting in. One game for Nintendo systems and it won't even be out until about the same time Smash 4 comes out. I could see Nintendo marketing their own games through Smash, as they already have, but third parties seem to rely on their iconic status, which Bayonetta doesn't have. I'm hoping for someone not from the Gematsu leak, just to confirm that there are characters outside of it to still be announced, but it's looking like Shulk. Finger crossed for Mermaid Man or even Tetris Block, but we all know it,s Jigglypuff and her friends Ness and CAPTAIN Falcon! ready to punish all other characters with all new movesets and special attacks!! The video is 3 minutes, which means Half Life 3 is confirmed. Ohh wait, i got it, it,s that hyped girl from Splatoon! Guys, it's not Captain Falcon, it's a NEW fighter. Also, I guess this is going to be the one to make or break that really accurate leak we have floating around. @dkxcalibur I was pondering that idea myself..
@Franklin You read my mind. No, accually I really want Shadow. Oh how badly I want him. But it's probably not gonna happen. Along with all the other 3rd party characters people are and will be asking for because Sakruai said he's already anounced almost all the 3rd party characters. And that was months ago. One of the main writers of Xenoblade tweeted about the announcement.... What could it be...? @Remisio Do you have a link for that? If so, I'd love to see it! Don't care, I want some real news for Smash bros like.... something that makes the Wii U version stand out other than it's visuals. So far I am not looking at buying it any more on Wii U because the 3DS version IS the Wii U version with extras. Square Enix games finally start showing up on the Wii U VC. As a direct response, the new character is.. Chrono!! And an HD remake of Chrono Trigger is announced, exclusive to the Wii U!! Sora! it,s possible right?, He made his job on nintendo DS and 3DS!! @sinalefa - "sinalefa" Thanks for the lesson, quite an interesting topic. I think I'm just going to pronounce it "fuhgeddaboudit". Though that isnt quite a correct interpretation, it was the first thing that came to mind. OK I think I got it if I spell it like this - synaloepha. I know thats greek and not spanish but I need mnemonics to help me remember things sometimes. He retweeted the announcement. What could it mean!? @Gunit1099 ...You have got to be kidding me. Well, if what some of you guys are saying about the creator of Shulk's game on Twitter retweeting Sakurai's tweet, and Shulk's voice actor mentioning he was working on a game he can't talk about yet, then I'm willing to believe Shulk will be revealed on Monday. Raymond Bryce to give everyone one hell of a day. All aboard the Isaac train! Although looking at the announcement they made, it seems unlikely but if it is true I will become a really happy gamer and a bigger Nintendo fan. I think whoever it is, that character is someone many people have been asking for (like Isaac) or a character from an inactive Nintendo franchise that people want to see renewed. Wonder Red is a trophy why are you guys guessing/hoping it could be him? Checking the word itself in a dictionary, it actually comes from the Greek, so you are good to go. 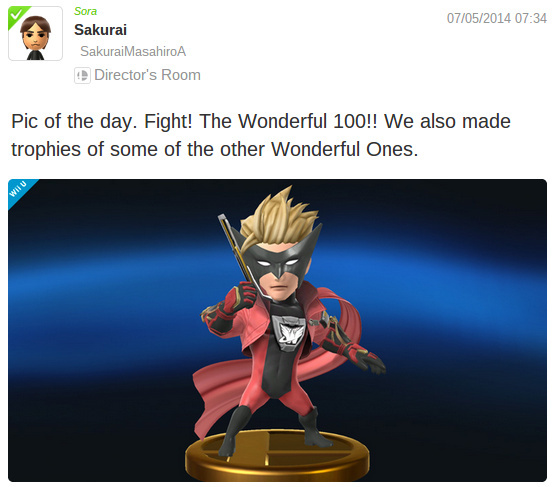 That disproves nothing, as all regular fighters also have trophies. Assist trophies are a different thing, though. It has to be Shulk. Ah okay, thanks for clarifying. I didn't know. @Remisio Thanks for the link! I'm even more excited for Monday now! Shulk's the one newcomer who I really, really wanted. This is so unprecedented and odd a format for announcing a new fighter that I actually suspect this is a two-for-one: they'll announce a fighter AND reveal a game release. I've always found it odd that certain legacy fighters still haven't gotten revealed yet--Ness and Captain Falcon most especially. So imagine this: we get a trailer for Ness, and maybe even Lucas--and then BAM: Nintendo announces that Mother 3 is coming to the US eShop. Cue fan jubilation! Or: Captain Falcon is announced, AND a downloadable eShop F-Zero game is revealed. Or: Wolf is announced, AND we get some serious Star Fox Wii U info. Wonder why they are waiting until monday, seems like a missed oppurtunity to do it after Evo when they could have done it during Evo. @Flashman No, I'm with you as well. I've never understood the hype surrounding it. Bomberman or Rayman would be sweet as! @teejay well Namco is well known for its DBZ games and since it's by far my favorite anime and Nintendo is my favorite game company it's only natural for me to hope for Mario to go against Goku, I think it would be epic. Geez, it's gonna be kinda nuts I guess. @Splatom YES, how could I forget about Captain Toad, that dude is probably the biggest boss in all of Nintendo. So many good characters but I'm just waiting for LUCINA!!! @WillMelnyk If Snake didn't fit, imagine how out of place she would be. Putting Bayonetta in Smash 4 would be like putting SpongeBob in Mario Kart 8. It just doesn't work. I wonder who will be revealed, though it might not be one of these characters. I can't see it being a returning fighter since they are delivering a three minute long unique video for it. They have only done that with the newcomers. Shulk or Chrom/Lucina are rightly popular here among the fanbase but it's solo nature makes me think there is a good chance it will be a third party character. Best think on Nintendo's more reliable relationships. Otherwise I'm betting on another Zelda character. Any one of these would warant a count down timer. I will be happy with whoever it is, but to side with AJWolfTill, my dream fighter is Professor Layton. Realistically speaking, I'm thinking the usual suspects, such as Shulk or Chrom. @joejoejohn That would so rock, though. A classic Simon Belmont. "'Tis I! never fear, Simon Belmont is here!" Wonder Red has already been shown as a trophy. There's other videos that show him but this is the first I could find. @Link506 First... Shadow's already an assist trophy, so he's been deconfirmed. Second, if Sakurai really did say he announced all third party characters ( which he didn't ) explain to me why Pacman, a third party character, was revealed only a month and a half ago. Also: When shadow joins the battle, Alfonzo replaces the assist trophy! A whole Live countdown? Nintendo better amaze me. SET GROOSE LOOSE. Still hope Snake stays out of this, personally. Nintendo is treating Smash Bros. as one of their top franchises... it's happening. Then again, all these wraps they keep keeping newcomers under will inevitably build hype and expectations too high to live up to. 1) Winged-pigs territory third-party dream character: Sora deeply dives into battle! It helps he has a lot of outfits (KH1, KH2 and related forms, KH3D). 2) More likely third-party character: Snake sneaks back in! Self-explanatory. 3) Second-party character: Isaac is summoned on the battlefield! As much as I love Marth and Ike, the series needs actual JRPG character, and Isaac's the best one to pull it off (well, Matthew is fine also). Cranky Kong. He's proven he can throw down on the platforming scene. He can prove to them all who's the best. Crono, Bomberman, or Simon Belmont. Guys, it's a "new challenger." Meaning it will NOT be a veteran. I'm personally hoping for a surprise… Chrom and Shulk are awesome, but are pretty safe guesses at this point. Bomberman, Kat & Ana, or Gardevoir would all be cool surprises I think. I don't know why people want a Kingdom Hearts character as Square Enix's rep. I would rather see a Nintendo era Final Fantasy character or if they wanted to make my dream character wish happen, someone(maybe one of the heroes) from Dragon Quest with a Slime and Dracky assist trophy. Plus, Dragon Quest is pretty much a Nintendo exclusive at this point. Unlike Kingdom Hearts and Final Fantasy which have not had a main series game on Nintendo platforms yet. Guys. we all know it's going to be me. @SockoMario The GamePad is big, but definitely not big enough for a Ridley Amiibo. @AlexSora89 Super Smash Bros. is basically Nintendo's version of the Super Bowl, it's where all their overrated and underrated hall of fame mascots and characters old and new come together for one major beat down. I'm going to guess it'll be a character coinciding with a surprise announcement for an upcoming wii u title. Something has to give with this new countdown approach. Perhaps F-Zero U and Captain Falcon! Hyrule Warriors launches in Japan soon so maybe Ganondorf. My head says it'll be Shulk from Xenoblade Chronicles. Just give us Ridley already! 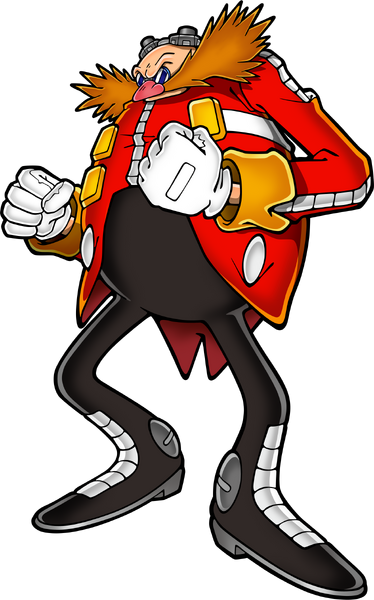 Eggman would be awesome too. @iEndzone Oh well, no shadow. But I said ALMOST ALL, not all. #2: Conker and his trusty frying pan! #4: Skull Kid, it,s about dam time! Bowser and King Dedede are back-to-back in a canyon, completely surrounded by Mario, Kirby, Donkey Kong, Link, Samus Aran, Yoshi, Fox McCloud and Pikachu. The group are approaching slowly getting closer and closer until suddenly ... Wario, Wolf O'Donnell and Ganondorf dive into the scene to give the two some backup! Bowser and King Dedede assume fighting stances, ready for the battle and there is complete silence from both sides as the melee is about to begin. A booming laugh sounds followed by a shriek that could only belong to the 2 newcomers, King K. Rool and Ridley as the two of them come roaring into the canyon. The fight begins as we see Mewtwo levitating slowly down into the frey, with glowing eyes as the camera pans out, and Pikachu eyeing him off fiercely. 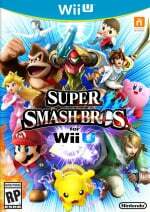 After the end of Brawl, Smash Bros. was split into two, portable and console. This marked the beginning of the era known as the hype train. A lone agent is sent in to deal with the situation, his code-name: Naked Snake. I know, that is exactly why the series' handheld debut is so long overdue. Thing is, my three guesses went from the least likely one (although possible), Sora (what with the Sony-only core series having, ironically, most of the spinoffs on Nintendo consoles), to the easiest one to add to the game, Isaac. Snake is somewhere in between - if Nintendo asks, Konami will listen. @TripleGamer3K @Blue-Alpha - Both Wonder Red and Midna are trophies? Well I'm fresh out of ideas. I got nuthin', and it's a weird feeling that I don't like. This reveal can't come soon enough. @Luigifan141 But going by that logic, then Toon Link wouldn't be playable, as he is the conductor for the Spirit Tracks 3DS stage. I feel like it would have to be a real game-changer to get this much attention. And also a simultaneous game announcement. So, who knows, maybe it'll be Captain Falcon. If everything didn't point to Shulk, I would say Takamaru. It seems sometimes like they want that guy to be something. Then they don't; then they do. You know? Shulk likely won't appearin Xenblade Chronicles X. The powers wouldn't really work in this game. And there's no point in pretending Shulk's regular costume is in any way an immensely popular or distinctive one. The Xenoblade guy is posting so all the fans of his games buy Smash and a Wii U. He's doing this to get the install base up. I mean come on, if the job you enjoyed doing could make you more money and be more enjoyable just by a co-worker succeeding, wouldn't you support that person? Sony wants Nintendo's competition and in the best real life example of my point, Sony's big wig owns 2 Wii Us and wishes more people would support what he thinks is a great system. Despite that both instances mean stronger competition, they support their comrades, whether in the same company or not. Despite a number of VC releases, I can't see Snake or a Belmont appearing either. The 3DS has both of Konami's two biggest franchises, but the Wii U has been denied any new games. It's not like Ground Zeroes and Lords of Shadow 2 were game of the year candidates either. I honestly can't think of any character I'd really want that isn't already in the game. Then again, I'm just here for fun. I have no intention of purchasing SSB in any way, shape or form. For either system. Like the Mario Kart games, it's fun to sit in and watch a bunch of self entitled 'adult' gamers moaning about how their 'great' ideas aren't in the games or how something changed and it's just so.... ZZZZZZZZZZ. BORING to hear the same drivel sometimes. God forbid a company that's been doing this for 30+ years might know more about making games than you. Right now, I think maybe @World has the best idea. Takamaru. And a full game, from the first person perspective. With Gamepad and traditional controls. Nintendo obviously wanted that game to be bigger than it was. Red Steel 3, with better controls, is still a dream. But what if Nintendo beat Ubisoft to the blade? I would start guessing who's joining the battle but I leave it to Nintendo to reveal the secret and hopefully doesn't get leaked. I'm wondering, where is Captain Falcon? I love the F-Zero series and he is a very good fighter. When Brawl came out I always selected him and I just hope they pick him for the new game in the series. If chrom gets confirmed then I will make a reaction video on my channel. @ShanaUnite Man, do you have any idea how happy I'd be to see Hector? Especially in contrast to Ike. I'm on the side of everyone who wants Shantae and Shovel Knight. Both are fantastic characters who would fit in the Smash universe exceedingly well. As I said before, Wonder Red is a trophy, not an assist trophy. As other Smash Bros. games have shown, all regular fighters get a trophy, so technically he could still be announced as a fighter. @ModestFan93 Bonk is who I want to see. Then you could have a Sega vs Nintendo vs NEC throwdown. If it's a NEW character, then I don't think it would be any of the veteran entries like Captain Falcon, Ness, Lucas etc, although I could be wrong. All signs are pointing to shulk but nonetheless every minute feels like 7 eternities while my heart is constantly racing and the agony of not having the character reveal at this moment feels like a thousand needles piercing through me. I cannot wait for this announcement. Hopefully it's Rayman or Chrom or something. Toon Link is driving the train in the spirit tracks stage but is replaced by alfonzo if he's chosen to fight so let's not count out Cranky Kong just yet. It better have the attack to throw Wii-motes. REGGIE MARKETS IN! Or it could be the guy from Wonderful 101. Last but not least, freaking Ridley! We shouldn't be questioning who this character is. What we should be questioning is why they deserve a countdown timer out of all the other character's? DOWN WITH RIDLEY!!! I am just praying that it doesn't happen! Isaac would be so much better! Or Chrom, or King K-rool, Or something that isn't Ridley!! @Luigifan141 No not my jellies and jams!! @Azooooz It's not a veteran. Sakurai said in his post that it'll be a newcomer. If it's not Simon Belmont, I'm going to fill my pants. @kurtasbestos I think it should be noted that this is Sakurai we're talking about here. It wouldn't be the first time he's slipped in a relatively obscure character. Besides, if there's any obscure series that deserves this it's definitely Xenoblade Chronicles. Now that we know X is another Xenoblade Chronicles game it makes even more sense. It would have to be someone /huge/. Third party, almost assuredly. While I'd love to see it be someone like Professor Layton, Simon Belmont, or Chrom, I think this character /could/ be someone who has appeared on Sony or Microsoft platforms. I'm /very/ interested, to say the least! Grandma from Wind Waker with a special soup final smash, or I cancel my pre-order. @sinalefa - Just so you know, I think somebody responded to me that Wonder Red wouldn't be in the game b/c he was a trophy. I don't follow the series religiously enough to know what the difference is. I'm still busy trying to rewire my brain to stop reading your name sinifela. A lot can happen in a 3 minute video. I'm sure Sakurai is announcing more than one character. Shulk & Sceptile for Smash!!! Assist trophies are characters that appear on screen to help you. They are not controlled by the player. @sinalefa - "your release date obsession "
This is before pokemon kalos region games because of the reason why he picked greninja. So he had to boost sales for a game announced back then. So that crosses out any character in a big hit game coming out soon. While for third party characters, nintendo has been with sega,capcom,namco,ubisoft, and indie games? So rayman is a possibility with a 10% chance of namco bandai anime characters like goku and naruto, and a 1% chance of being banjo and kazooie. Sakurai places characters who have been forgotten at a point: ness,C.Falcon,ice climbers, little mac, ROB,G&W, [classics] so a character with a game in the past and no modern games is a strong possibility maybe ballon fighter or the guy from excite-bike. But i need you to help me with getting the answer, theres one strong clue left. Sakurai puts characters for the next smash bros game in as trophies, usually in sections apart of those characters in the game. Like how there where animal crossing trophies in brawl, the wario trophy in melee, little mac as a assist trophy in brawl. Who can it be? Use my clues to help you. Not to add to the ridiculous speculation pile but years ago to hype up the Diabolical Box I remember a tweet from either Level-5 or some official Layton twitter account that was written in Professor Layton's voice. He says that he was invited to some Smash Tournament and when he got there he found a cursed doll (GENO), a tiny boxer (LITTLE MAC), and a blue robot (MEGAMAN). Given that two of those have come true I'm hoping that Layton and Geno will be announced and that the Gematsu leak characters are also in it (SHULK, CHROM, and the CHORUS MEN). If there are characters like Rosalina who Gematsu just missed and he also is planning on keeping some new characters totally secret to launch then the best thing to do would be to release these movies on non-Gematsu characters since he's known about the leak for a long time I bet. Of course, this is a lot of speculation mixed with hope mixed with love for Super Smash Bros and a boatload of other franchises so don't take what I say too seriously! Isaac, garet, or really anyone from golden sun because they deserve to be. Chrono would be awesome. I mean the list is really long of characters that should be in this however I dont know if I missed something but the amount of mario characters is too damn high with the amount of others. Which brings me to my next question, why is ganondorf not in this? Can't wait to find out who it is!! Any of: Isaac, Mike Jone, or WindWaker's Samurai Ganon would make me very happy. @deathmetalkrunc Right? I've been waiting for the Ganon(dorf) reveal. Since they're doing away with clone characters, maybe they'll revamp him to dual-wield swords like in WW, or have him as Demise instead. I didnt even consider demise! That would be so awesome. Or zant. Either one.